In 2015 the largest category – which includes nieces and nephews – amounted in 33% of inheritance cases. THERE’S BEEN A massive jump in inheritance tax takings, and nieces and nephews are getting the brunt of it. New figures provided by Fianna Fáil’s Michael McGrath show that the yield from Capital Acquisitions Tax, which is applied to gifts and inheritances, has increased by over 65% since 2011. The amount that a person might have to pay out depends on the relationship between the person inheriting and the deceased. A spouse or civil partner is required to pay no tax. For all other beneficiaries, a tax-free threshold amount is afforded, after which Capital Acquisitions Tax has to be paid. These beneficiaries are split into three different groups. Sons and daughters receive the largest tax-free amount. The second group is made up of parents, brothers, sisters, nieces, nephews and grandchildren and the third group includes any other type of relation. The hike in takings follows reductions in the thresholds in recent years, resulting in a major increase in the number of transactions caught in the tax net. 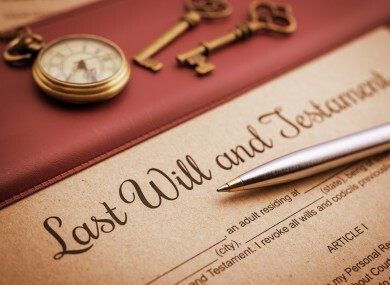 In 2015 the largest category – which includes nieces and nephews – amounted to 33% of inheritance cases. Figures show the tax take for this category jumped from €121.7 million in 2010 to €183.2 million in 2015. Gifts and inheritances in the category known as “strangers in blood” (category three) amounted to 23% of all cases. This jumped from €34.8 million in 2010 to €58.9 million in 2015. A total of 21% were in respect of a sibling, while only 18% of cases involved a child of the deceased. The programme for government promises to raise the tax threshold for all gifts and inheritances from parents to their children from €280,000 to €500,000. Tax take for this group of parents to children more than doubled between the years of 2010 to 2015 from €76.5 million to €156.1 million. McGrath said it was not enough to just increase the threshold for children of the deceased. As it stands, Minister Noonan plans to increase the Group A (parent to child) threshold from €280,000 to €500,000 but leave the Group B (other blood relative) and Group C (stranger in blood) thresholds unchanged. These are already at very low levels of €30,150 and €15,075 respectively and were not changed in Budget 2016 when the Group A threshold was raised by nearly 25%. He said it is every person’s wish to provide financial security for family members and people close to them. People will naturally want to be able to pass on the benefits of their lifetime’s work to their children, grandchildren and other family members depending on their particular circumstances. The changes in inheritance promised by government will not impact on those that are most affected by the rates of inheritance tax, said McGrath. As can be seen from the figures provided to me, the proposal not to change the Group B and Group C thresholds does not reflect the very large number of inheritance tax cases which involve family members other than children and also those involving non family members. He said it is particularly unfair to people who do not have children, but have relatives they wish to provide for. Email “There's been a huge jump in inheritance tax takings - and nieces and nephews are hit the most”. Feedback on “There's been a huge jump in inheritance tax takings - and nieces and nephews are hit the most”.